We consider Neo Buggy’s readers and visitors pretty well read when it comes to all things RC Cars, but in a series of articles we’ll try to cover and explain a few of the unique features of an event less than a week away that only comes around every two years – the one every driver wants to win – the IFMAR World Championships. Lets start at the beginning, IFMAR stands for International Federation of Model Auto Racing and was formed in 1979 by Ted Longshaw – conceived as an organisation to bring the different, fragmented organizations under a single, governing body unifying rules the world over. IFMAR is made up of four governing bodies; which we usually refer to as ‘blocs’ they are EFRA (Europe), ROAR (N.America), FEMCA (Asia & Australia) and FAMAR(S.America, Israel & S.Africa). To compete in an IFMAR sanctioned event a competitor must first be a member of a national federation (e.g. BRCA, FVRC etc) and in 1/8 Buggy fulfil that particular federation’s criteria to qualify to take part. These ‘criteria’ vary but usually involve finishing at the top of the national championships (ROAR, BRCA) or end of year rankings. The Worlds is usually oversubscribed with bloc countries crying out for more spaces, IFMAR guidelines state that entries are distributed first on a per bloc basis; then depending on the number of countries/national organisations within that bloc they are distributed appropriately. In the case of ROAR this is not applicable as they only govern North America and used the 2011 ROAR Nationals as their ‘Worlds qualifier’. For EFRA & FEMCA it’s a bit more complex as they govern 15+ countries, usually countries request ‘X’ amount of spots and receive a bit less – in that sense the World Championships is not as ‘true’ a test of the World’s best drivers as it could be. Example: Spain receives 5 spots from EFRA and FAMAR allocate 10 spots to Brazil – it could be said that the 10th best driver in Spain is at least as good or better than the best one from Brazil – however this is a subject for debate and not fact, only used as an example to illustrate the system of entry. What it does promote however is a worldwide ‘feel’ to the event as it guarantees spots for all countries, not just the well-established ones. The 14th IFMAR 1/8 Offroad World Championships are being held on the outskirts of Buenos Aires, hosted by the AAPARTT club at the Speed Paradise track. Argentina is part of the FAMAR bloc; originally Brazil had been selected as 2012 hosts, but grumbles from industry insiders over customs issues saw the host nation ironically change to Argentina. Customs and entry issues featured heavily at the warm up event in late September with many racers leave with a bad taste, however the organisers have been proactive and reassured everyone that there should be no issues for the real event. Watch this space, if everything goes smoothly expect nothing to be said, if not questions of IFMAR’s credibility will be raised. There is a rotation of the host blocs in all the classes which determines where they will be held, pending that bloc accepting IFMAR’s invitation to host. Looking back, 7 of the 12 Worlds to date have been hosted by EFRA (86, 88, 92,94, 96, 98) – the last one in 2004. The rotation order may seem illogical but motions were put in place so it unifies eventually. FAMAR – the current host bloc have only hosted the Worlds once befre, in 2002 in Uruguay, now 10 years later, they’re hosting their second World Championships in 1/8 Buggy. The Worlds have been going since 1986, the first World Champion Fredric Veysseyre racing a Yankee 86 powered by a Cipolla engine, he held off to win infront of Pedro de la Rosa – F1 driver for HRT and Monesi in 3rd. There is a fantastic video (in French) from Grenoble ‘86 which we’d recommend to watch, check out the amount of spectators! Japan are the most successful nation with Hara’s win in 2008 giving them 4 World Championship titles, in recent years however it’s been all about the USA, now level with Italy on 3 Worlds wins. Its clear that in the last decade Europe has suffered with only Guillaume Vray’s surprise win in 2004 since the glory years of the mid 90’s, this gives Europe 6 wins to ‘non-Europes’ (US & Japan) 7, could the balance be restored on the Speed Paradise track ? 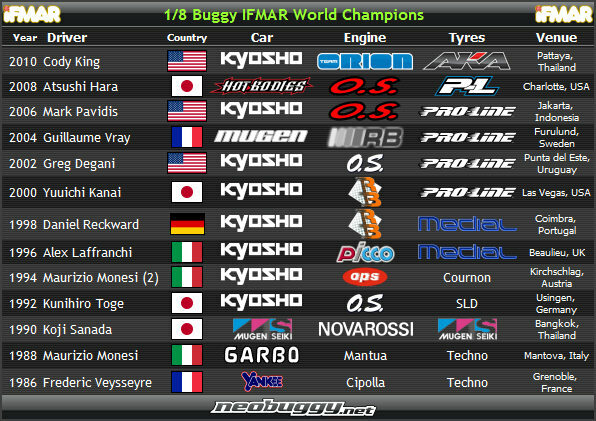 We’ll look at the individual candidates in a later feature but 1/8 Buggy has undoubtedly been dominated by Kyosho throughout most of the World Championship’s 26 year history – 8 victories despite some competition in recent years the team from Japan look very strong wielding their MP9s. For 10 years Pro-Line ruled buggy with 5 consecutive victories, the first with Greg Degani a decade ago running the first Knuckle tyre – AKA poached the crown in Thailand, can team manager Daniel Adams overcome the tyre import obstacles and emulate their first win, once again on South American soil ? There are always the ‘What if’ stories surrounding the Worlds; in Kirschlag ’94 Alessandro Catozzi (TAG/OPS) was dominating the final, leading by over a lap until he broke with 20 mins to go. In 2002 whilst leading Richard Saxton ran out of fuel with 25 mins to go, in 2004 Daniel Vega looked on course for a dominant win until his servo overheated – a problem only caused because he was attempting to protect his car from stones and gravel entering inside and getting caught in the drivetrain by using foam. Perhaps the unluckiest man though is Yannick Aigoin – in 2004 he TQ’d and was easily the man to beat only to be disqualified after the semis for a fuel tank infringement. Cue the 2006 final, way out front but again bad luck struck him when he crashed and whilst being marshalled his car flamed out – costing him dearly. Pressure is perhaps the main culprit to blame for many of the stories, drivers at the peak of their careers knowing full well that they may never have as good a shot at fulfilling their promise, the pinnacle achievement is winning a World Championship. The fact that there has only ever been a two-time winner (Maurizio Monesi, ’88 & ’94) puts it into perspective; a Worlds win is rare, only twelve men have won, twelve men have also walked on the moon. There are plenty of heartbreak stories when it comes to the final that really counts, only one man can win and the cliché stands – first you must finish.